There is a churning afoot along the seaboard states. Events in Bengal over the past 48 hours are leading indicators of the change to come, with the incumbent chief minister of Bengal going to extraordinary lengths to disrupt legitimate political activity in the state while precipitating a constitutional crisis in the face of an imminent anti-corruption crackdown. The meltdown in Kolkata had a familiar echo in Lutyens’ Delhi with a predictable chorus of media cheerleaders losing sight of both constitutional propriety and judicial case history. The media cheerleading follows the palpable anxiety within the Lutyens’ elite with the final budget of the first term of the Narendra Modi premiership delivering a shocker. The Budget that successfully triangulated three key constituencies has set in motion a course that will shape the campaign for the next general elections. The past five years have seen a marked diminishing of the disproportionate clout the Lutyens’ elite had exercised over the decades on the discourse of the nation. To put this disproportionate influence into perspective, one has to but merely look at the television viewership ratings as reported by the Broadcast Audience Research Council of India. In what must be seen as a huge setback to the Lutyens’ elite, the weekly ratings reported by BARC last week in the English news genre saw an unusual entrant into the top tier of news channels in that language — the public broadcaster Doordarshan knocking out a Lutyens’ elite favourite, NDTV! What went unsaid and unreported in this development is the minuscule viewership base of the English news channels within the universe of television viewership with less than a million impressions during the week for most English news channels. It is a telling commentary on the disproportionate influence exercised by the Lutyens’ elite that several of the English news television anchors were feted with national honours during the UPA regime despite their relevance being limited to an English-speaking micro minority within the nation. The past five years of Modi’s premiership have underscored not just the grand irrelevance of this elite but also the shifting of the discourse far beyond Delhi. Little wonder that the course the next several weeks will take in the run-up to the general election will be determined not by the unholy alliances of the heartland but by the political churning along the seaboard states. The year 2019 will witness perhaps the first of several general elections in recent memory in which the extended Indian Ocean coastline is where the contours of the next election will be decided while the Lutyens’ elite remain fixated on the unholy alliances of the heartland. From Bengal to Kerala, political events of the past several months have put a whole range of seaboard states into play. The judicial overreach in the Sabarimala issue has sparked Hindu identity consciousness in ‘God’s own country’ to a degree where the last surviving bastion of communism in India is all set to crumble. This puts all of Kerala’s 20 Lok Sabha seats into play for the first time beyond the traditional binary of UDF-LDF politics. If the unintended consequences of a court verdict have put the present communist bastion Kerala in play, diagonally across on the India map in Bengal, political overreach of Mamata Banerjee has put the one-time communist bastion in play. It was not without reason that the Bharat Ratna for former President Pranab Mukherjee found its way to the R-Day honours’ list — for Bengali pride, coupled with a backlash against Mamata Banerjee’s rabid minorityism, is paving the way for a saffron rise in the east. Sustained focus on Odisha and the natural tide of anti-incumbency against Naveen Patnaik’s BJD put the other eastern board state with another 20 odd Lok Sabha seats in play. The biggest surprise in this churning though will be Andhra Pradesh and its 25 Lok Sabha seats. Between Naidu’s bravado and YS Jaganmohan Reddy’s pedestrian revolt, it would appear that the BJP has no direct stakes in the state. But the manner in which Rahul Gandhi’s Congress has snubbed an overzealous Naidu by declaring its intention to go it alone in Andhra Pradesh points to a four-way split in the non-BJP political space in the state. The resulting political churning is where the opportunity lies for the BJP in Andhra Pradesh. Unlike every one of the other four political formations in Andhra Pradesh, which have an overtly casteist appeal, the BJP stands alone in the state in transcending caste and appealing to a plurality in the region. The angst that has been riled up in Andhra over special category status is a political zero-sum game, with every one of the other four formations annulling each other’s claim to represent the constituency most aggrieved by the denial of so called “special status”. Modi’s secular appeal to the youth of Andhra rising above narrow parochial caste considerations is a game changer that can produce political nectar out of the churning rise from the venomous politics of the TDP and its primary rivals in Andhra. Creative political management factoring in local dynamics in Tamil Nadu has the potential to further add to this kitty if the BJP is able to inherit the political space once occupied by J Jayalalithaa. This leaves the BJP’s traditional bastions in Karnataka, Maharashtra and Gujarat making up the rest of the extended Indian Ocean seats the battleground where the next government is likely to be elected from. The extended Indian Ocean states account for a total of 273 Lok Sabha seats, which coincidentally is also just past the half-way mark for a simple majority in the Lok Sabha. If 2014 saw the Modi led BJP pitch a Mission 272+ campaign against a hung Parliament, the campaign for 2019 is now about a Mission 273 to capture the extended Indian Ocean seaboard states within which BJP has won as many as 95 Lok Sabha seats in previous elections, with nearly 77 in 2014. By targeting the 42 seats in Bengal, 21 seats in Odisha and 20 seats of Kerala, little wonder, Modi’s ‘samudra manthan’ has Banerjee in a state of abject meltdown. The churning afoot has exposed the venomous intellectual dishonesty of the Lutyens’ elite, too, who have reduced the politics of the nation to a spectator sport. Abusing their disproportionate influence to cheerlead an unholy nexus of vested interests, they have been propagating negativity and political nihilism. There is nothing moral about the so-called mahagathbandhan and the unholy nexus it represents. Rooted in desperate politics of self-survival, the immorality of the mahagathbandhan will ultimately be triumphed over by the samudra manthan in the seaboard states along the extended Indian Ocean coastline stretching from the Bay of Bengal to the Gulf of Kutch. 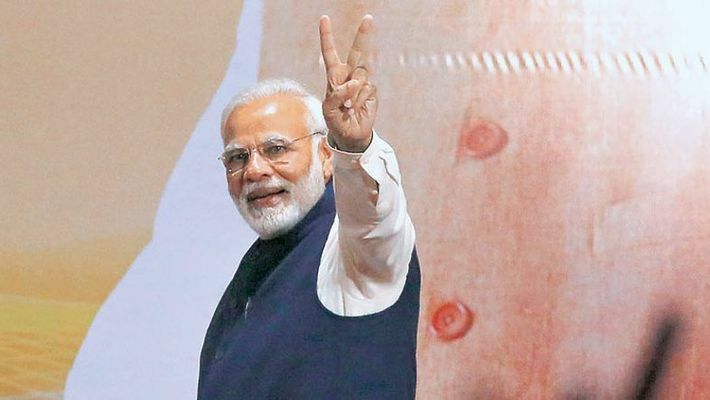 Thanks to the marathon campaigning by Modi who has taken the battle to the doorsteps of the regional satraps in these states, Mission 273 of 2019 takes the battleground outside of the Hindi heartland.